Yes, we have punter analysis. Leading up to the 2018 NFL Draft, we looked at each of the Philadelphia Eagles' positional groups, determining if they are likely to select a player at each position with one of their six picks, as well as noting some players who make sense along the way. Today we'll finish off that series with the specialists. • K Jake Elliott: Elliott was money from long distance, and had ice water in his veins on clutch kicks, most notably in Week 3 last season against the New York Giants, when he hit a game-winning 61-yard field goal, and in the Super Bowl, when he hit an underrated 46-yarder with just over a minute to play to extend the Eagles' lead to eight points. He's not going anywhere, though it will be interesting to see if the Eagles give him any kind of competition in training camp. It seems like in recent years when Eagles kickers went unopposed in camp, they faltered some. Plus, a kicking competition gives me something else to watch in practice, which provides nice filler at the end of training camp reports, so throw me a bone, Howie. • P Cam Johnston: After Donnie J'owns (cough) "retired," Johnston, who had signed a futures contract at the end of the regular season, was left as the only remaining punter on the roster. I think the Eagles were open to Johnston replacing J'owns last season, but J'owns clearly beat out Johnston in camp. I would call it likely that the Eagles will bring in another punter for competition. • LS Rick Lovato: More than a few people freaked out when the Eagles traded fan favorite Jon Dorenbos to the Saints last offseason, making Lovato the new long snapper. As it turned out, Lovato was fine. He'll almost certainly return as the long snapper in 2018. So, could the Eagles address any of the specialist positions in the draft? There's a punter in the 2018 NFL Draft who some believe could become the best in the NFL in Texas' Michael Dickson. Some are projecting him to go as high as the third round. While I value special teams more than most, the Eagles only have six picks and they go for it on fourth down more than any other team in the NFL. I can't wrap my head around taking a punter that high (or even in the fourth round, for that matter). 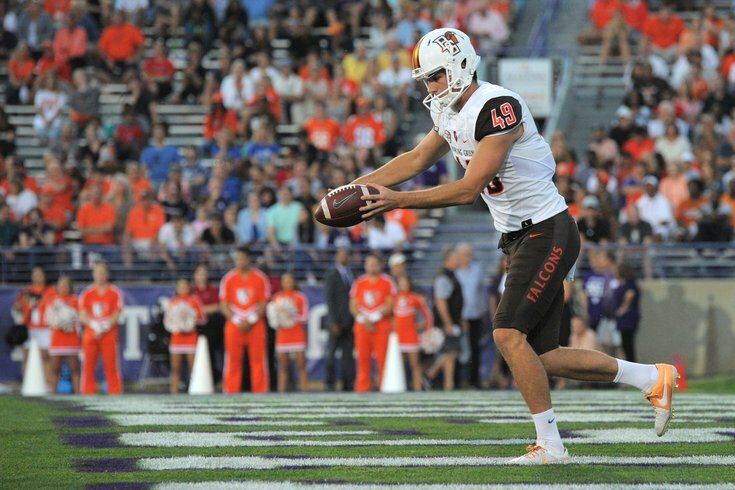 One punter I could see the Eagles having interest in is Joseph Davidson, a 6-foot-7, 232-pound punter from Bowling Green. Why? He's a left-footed punter. While left-footed punters were probably more of a "Chip Kelly thing" than a "Dave Fipp thing," it's perhaps not the worst idea to have both a righty and a lefty in camp to allow the returners (some of whom might be rookies) to get their share of reps fielding punts from both. Davidson is projected as a seventh-round pick, but if he were to go undrafted, the Eagles would have a great pitch to him and his agent to come to Philly, seeing as the Eagles' present punter has no regular season experience. Also, thank you for reading this far down about the possibility of an undrafted free agent punter from Bowling Green.